Epi Les Paul - Comments? Discussion in 'Guitars in General' started by Dickie Fredericks, May 12, 2008. I have an opportunity to pick up a Flame Top 2000 model for what Id call a good price. Really Really good condition. Other than a little dirt its almost perfect. I love my Epi LP Standard Plus Top. Great playing and sounding guitar and it weighs less than 7 1/2 pounds. Which is a plus for my bad back. They certainly look nice, I prefer the Gibson LP specials, I have a faded special that I paid $635 new at GC a few years ago, not as pretty but really a better sounding guitar IMO, than the Epiphone pups, I have an Epi Sheraton II that I picked a few months ago, replaced the pups and love that guitar now. Even though it was too light body/neck heavy, I grew to love the fretboard and the tone. So 2 months go by and then got a Gibson, a 1993 standard with some very flat worn frets. Turns out I love the flat frets. They sound way closer to a Les Paul than any Strat, ever, (AFAIK) so represent a great alternative. The pups improved in 2002, I believe. Mine sounds good, plays OK, for an LP. Love mine. They play great but the pickups and pots are a bit low in quality. That being said, I played mine with the stock hardware for the last 7-8 years and have just finally gotten to swapping out the pups. Yeah, its a Standard Plus. Of course Im gonna change out the pups, switch, pots and jack. No case but I think for 2 bills it may be a good deal eh? You can't go wrong for that price. Hard to go wrong imo for that price. I've played the hell out of mine over the years. I called the guy and told him Id pick it up shortly. Im probably gonna let the singer use it for a few tunes and Ill probably use it for a few as well. I like my tele for slide but this could do the trick too for the few songs I play slide on. At a show last week the opening acts guitar player had an Epi LP with Bill Lawrence pups in it through a Twin. Sounded as good as can be expected considering the Digitech all in one thing he was using. Im thinking a Super Distortion in the bridge and a PAF in the neck which is what I had in my LP Deluxe that I sold to buy a Warmoth back in '87 Silly me. My nephew's Epi LP had even better fit and finish than my Epi Dot Deluxe Flametop. Understand that the construction is slightly different than a Gibson LP, youv'e got a veneered top instead of a thick maple cap, and possibly a maple neck instead of mahogany. But having said that they're fantastic guitars and are very well made. You know enough to rewire it using quality wire (I had no complaints with the switch or even the Alpha pots, but the jack and cheesy coax had to go) and youre choice of pickups, and you'll be sitting pretty. Maybe a roadrunner or StewMac ultralight not-so-soft case and your really in business. If you are prepared to swap out the electronics, then go for it if its in good shape. Epiphones of that time period were notorious for **** electronics, especially the toggle switch. Plays good i take it? Great guitar at that price - a little fretwork and the upgrades you mentioned and it'll be a great player. I have some pickups for sale if you need some - Gibson and DiMarzio - LMK. Another thing to consider is if you add the price of the guitar and the cost of the upgrades you might be able to score a Gibby Vintage Mahogany, or Epi Elitist for the same price range. Plays great. Its dirty for sure like its been in a bar. The binding is a tiny bit yellowed but thats kinda cool IMO. It has a layer of crud on it for sure but the finish as far as I can tell on the body and neck is like new. After my first real guitar, (which was an Epi Flying V-yes I wish Ihad it now. I was 14 then.) I had that Deluxe which was Vintage SB. I had Chris Lukasik put the Dimarzios in there and change the tuners. I was young and dumb eh? Sure route the body for those pups LOL Once I got rid of the Deluxe in I guess 85-86 I grabbed a Strat and thats pretty much all Ive played since. Anyway Ill post up some pics after I pick it up and clean the crud but its very much like the one pictured above. 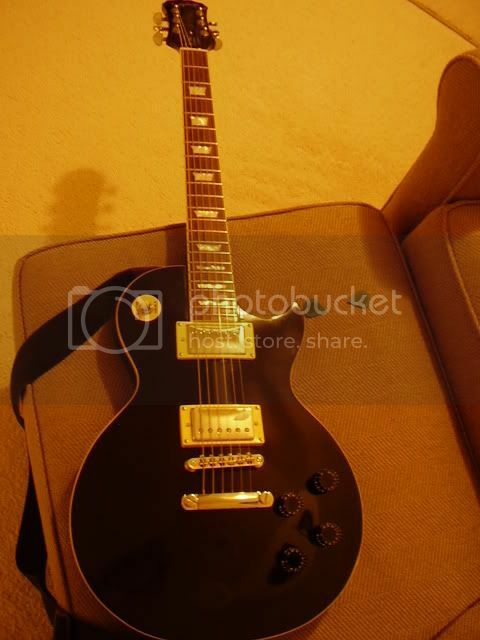 I've got a 2007 Epi LP Plus Top. Swapped out the pickups for some locally handwound unpotted PAF clones, and the thing absolutely screams. My only complaint is that the jack has come a little loose, but no biggie, I can fix that for bugger all $$$. You arent that far from me. Im in Chesterfield just across the border. One of our guys in the band is in Mint Hill and another in Charlotte.